The Shield Chart is the basis of most methods of Geomantic Interpretation, and generating it is a very simple process that can be done quickly and efficiently. To start, one must prepare properly (a process I describe here), and then begin the process of generating random numbers. -Anything else that can generate either a 1 or a 2! I personally use a set of four colored dice (representing the four elements) with either one dot or two on them. Rolling them all at once yields an entire figure. Each possibility represents either one dot (traditionally represented as a 1 in the binary system) or two dots (traditionally represented as a 0 in the binary system). The generation process begins by generating four Figures, known in the shield chart as the Four Mothers. When generating Geomantic Figures, one does not randomize between one and sixteen and select the proper Figure based upon its traditional order. Instead, one generates each of its four rows of dots separately. In order to generate one Figure, one merely has to randomly select one dot or two (using the way chosen above) four times, and in order they will yield the Fire, Air, Water, and Earth lines of the Figure. Do this whole process four times (yielding sixteen randomizations), and you will have the four Mothers. Place them in the appropriate places on the chart, writing them in right to left. Once one has generated the Mothers, one generates the Daughters – who are called as such because they are derived from the Mothers. This is a simple process; the First Daughter is made from the Fire lines of all four mothers (in order from first to fourth, right to left), with the Fire of the First Mother being the Fire of the First Daughter, the Fire of the Second Mother being the Air of the First Daughter, the Fire of the Third Mother being the Water of the First Daughter, and the Fire of the Fourth Mother being the Earth of the First Daughter. The Second Daughter is composed in the same way from the Air lines of the four Mothers, the Third is made from the Water lines, and the Fourth is made from the Earth lines. Write these Daughters in their proper places next to the Mothers, from right to left. At this point, the entire first row of the Shield Chart has been generated. The second row, that of the Nieces, is done differently. Each Niece is associated with either two Mothers or two Daughters, and each group of three positions makes up a Triplicity. The fact that the two Daughters or Mothers generate the Niece is why the Niece in a Triplicity represents the relationship between the two, as it is made from a combination of parts. In order to generate a Niece from its associated Mothers or Daughters, one has to compare the two Figures. Start at the Fire line of each of the two Figures being compared. If they are the same (i.e., both one dot or both two dots), then the Niece gets two dots in its Fire line. If they are different (i.e., one is one dot and the other is two dots), then the Niece gets one dot in its Fire line. The rest of the Niece is generated by doing the same thing for the Air, Water, and Earth lines. 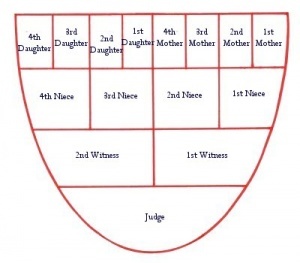 Once one has generated all of the Nieces, one repeats the process, using the two Nieces associated with the Left and Right Witness to generate the Left and Right Witness. The last step in generating the Shield Chart is repeating the process one more time, combining the Right and Left Witnesses into the Judge, which is made from the entire chart. Because of this process of adding Figures together to generate higher levels of the chart, certain patterns always emerge when certain Figures are grouped together. For example, if you combine Cauda and Caput Draconis together (in the manner used to generate Nieces, Witnesses, and Judge), then you will always get Carcer, indicating the isolation of being trapped in a loop of beginnings and endings. Because of this, specific patterns will begin to have specific meanings as one reads a chart, and these patterns can become key to interpreting the chart. This entry was posted on June 15, 2012 by Z. M. Wilmot. It was filed under Geomancy . Youre so cool! I dont suppose Ive read anything like this before. So good to seek out anyone with some authentic ideas on this subject. realy thanks for starting this up. this website is something that is needed on the web, someone with a bit originality. useful job for bringing something new to the internet! Ive also been using the dice for almost a year now. I find it the most effective. Invoking the angel HRU has been an extremely potent practice, more so than invoking the planetary spirits, which could be dangerous if not done correctly. This angel HRU is the angel who governs the tarot and all acts of divination, when invoked he opens portals in the minds eye to help you interpret the symbols in truth.